In view of the fact that the RIO Olympics have just started, I thought this photograph of the finish of the mens’ 400 meters might be a bit of a laugh. I came 2nd and the winner was also a Brighton General Hospital male nurse. These games were run every year up to the late 1950s and were very hard fought. All the Brighton and Hove hospitals took part and they were great fun. 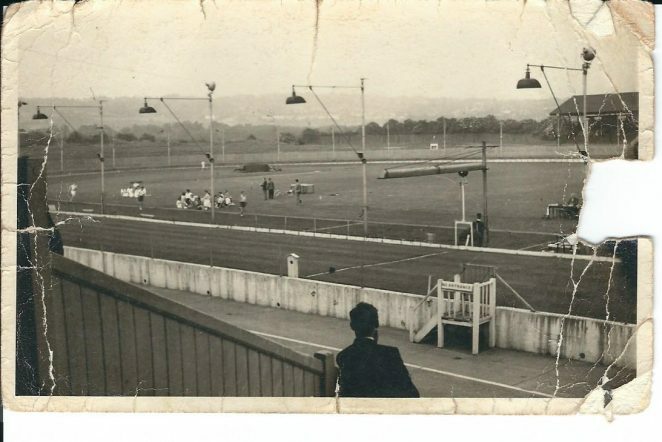 My guess is that’s the Greyhound Stadium in the background, and looking towards Hove Park and Dyke Road in the far distance! Yes sorry I forgot to mention the venue it is as you say, the old Dog Stadium. I think on the LH side, just out of view, would be where Waitrose now stands (previously Co-op). Does anyone remember when cars still used the road that ran past the Engineerium, down into the park and up the Droveway? Also just on the LH side where Waitrose now is was wasteland, with a derelict building, which we used to play in on our way (walking) home from Cottesmore School to Hangleton. I’ve never been able to find out much about that building, despite leaving posts on this site, does anyone remember or know?